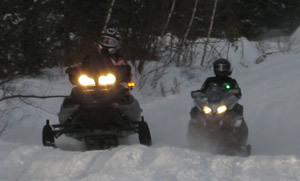 "Anyone that rides a snowmobile knows how scary it can be at times when approached by oncoming sleds. How many times have you tried to utilize the hand signals? You raise your left hand to indicate how many in your party are following behind you. Suddenly you hit a bump and you get knocked aside nearly miss the oncoming sled or the tree that's sitting too close to the edge of the trail. You quickly put your hand back on the handlebar to correct your dangerous maneuver. Clearly this has bugged me on many occasions knowing I'm compromising the safety of myself and possibly others, Well, no more. This product helps resolve these dangerous situations. I have seen this product in use. At first it I wondered if it was just another gimmick, but it truly has shown to be a great safety device for your sled. I'm seeing many more sleds equipped with RideLite™ and believe this product is a great necessity. I must admit it is very easy to understand the light game, no guessing and a lot safer approaching those that use them. Their hands are on the handlebars, making for less chance of a collision, giving you safer feeling when passing oncoming sleds. The product is praised by the Fish and Game and NHSA for Safety. Thank you RideLite™! "Thanks so much...I think this will be one of the best gifts ever!" "I appreciate your quick response to my inquiries and want you to know that it is great to do business with such a friendly and prompt business. It's been a pleasure dealing with you." - Lisa M. from VT. I am confident this product will save me or my son from an accident, the very dangerous hand signals are a thing of the past." - Jim S. from NH. "My own motivation to buy happened several years ago when I watched a young lad crash into a tree after taking his hand off the bars to give me the closed fist, last rider signal. I have no doubt that he likely had that signal instruction drilled into his head by his well intentioned instructor but missed the 'only when it's safe to do so' portion of the instruction...I firmly believe that as the RideLite™ receives more exposure and subsequent usage we will see fewer "incidents" on the trails. I know that I'll be doing my part to spread the word. Best regards and thanks again for producing such a high quality, important product for the future of our collective riding safety." "Being in the manufacturing and customer service field myself, I have to commend you in your customer service. Absolutely the best I have ever dealt with, I feel you went above and beyond anything a reasonable customer could expect. I am a Vermont Safety instructor. 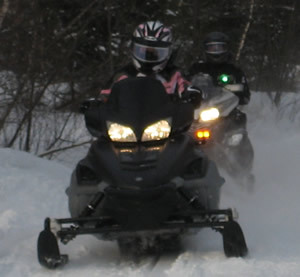 I feel this is one of the best safety improvements that has come into the sport of snowmobiling in a very long time. You have a first class, high quality product and customer service to match. My best to you all. " - John M. from VT.
"Wow, great idea, great product, great service! " - Allen W. from PA.
"The RideLite™ is a High quality durable product!" - Jason L. from MI. "This has changed snowmobiling forever, super customer service too." - Tom G. from NH. "Thank you for making the sport better, these should be mandatory, all the best to your company"
- Matt N. from ME. "Duh, what's to think about, everyone should have these, keep up the good work "
- Sara H. from NY. "Great surprise with the quality and brightness, fast shipping as well I had it next day, Thanks!" - Terry B. from CT.
"Thank you for the great product. All our family and friends now have them. We wouldn't ride with out them, thanks again." - Glen A. from MI. "This is the product of the decade! " - Jim P. from NH. "Thank you RideLite™, I won't ride with out it." - Tim R. from RI. "I am very happy with my RideLite™ unit. It was very easy to install and looks great. Both the green and yellow lights are very easy to see in the day and extremely bright at night. My hopes that in order to make snowmobiling a safer sport, everyone would install one of these units on their sled. Of all of the people who have seen my sled with the RideLite™ unit, they were very impressed and thought it was a great idea." - Dana R. of Laconia, NH. 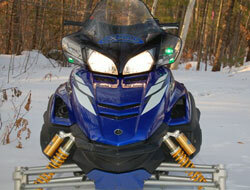 "I have not put too many miles on my sled, yet, but I have installed the light and I am looking forward to using it. I hope that more people catch on, as this will prove a very worthwhile and long overdue investment. Thank you for providing an awesome product! Again, between my brother and I, we bought three of them." I really like the quality of your product, the added safety for my wife and I as well as the durability of your product. It even withstood the impact of striking a deer at 65 mph last week. My 07 Attak GT was totaled but your lighting system stands poised and ready to install on the replacement sled. - Doug K from Il. "After installing the RideLite™, I really noticed how sleds were all over the trail while being ridden one handed, while I was firmly in control. When people signal with their hands to give a heads up, it's really quite dangerous. Typically, a sled needs constant steering corrections to stay in position on the trail. Riding one handed makes that difficult when you need control the most, passing oncoming sleds. "The concept for these lights is almost a no brainer, like 'Why didn't I think of that?' At first, it's hard to keep your hands on the bars. It feels weird to not signal when approaching sleds are doing their part. Keeping your hands on the bars allows you to pay more attention to the trail and what's going on. I truly believe that it's a product that anybody riding a sled should run. I know I won't ever ride without mine." "Great idea, Got to have them!" “Great Idea! I'm putting one on my sleds"
"This system is much safer than using the current hand signals"
"This is something that is going to change the sport for the better." "Great Change, keep your hand on the bars and safety in the forefront"
"Greatest new product to come out in years"
"This is long over due and should be a factory part." "A great new concept. It's a must for all riders. It's easy use and understand"
"I think it’s a great idea. I hope everyone catches on and gets one"